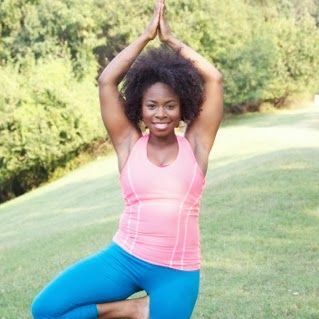 Recently, Yoga International contacted yoga instructor Sariane Leigh, aka “Anacostia Yogi,” to discuss her perspective on yoga and body image, common assumptions about yoga, self-acceptance, and the role of asana, breath technique, and meditation in healing and transformation. 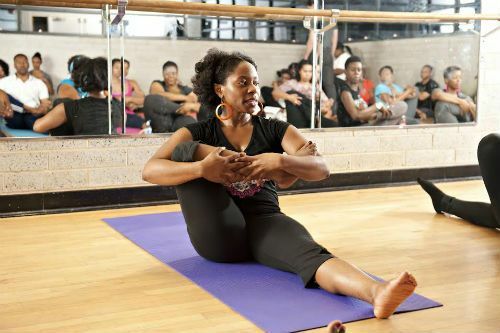 Sariane is a health and wellness leader within her community of Washington DC, east of the Anacostia River, where she offers affordable vinyasa-style classes. You can check out her work at anacostiayogi.com and follow her on Twitter @AnacostiaYogi. 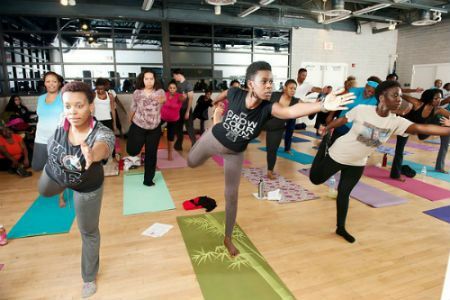 How did Sariane Leigh become “Anacostia Yogi”? Please describe your journey to yoga: Why do you devote your life to this practice, and how has it changed you? I began practicing yoga after a traumatic event, when someone I loved died rather violently. 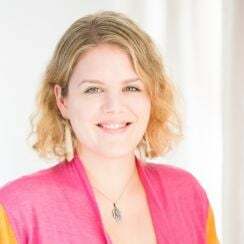 At the time, I was living in a small town in Belize, Central America, and had little access to traditional healing resources. Luckily, a close friend of mine was involved in a group called “Art of Living,” which emphasized using breath techniques to move through deep mental and emotional pain. When he came to visit, he taught me what he knew, as well as meditation and asana, and the knowledge has forever changed me. Now I know that I have a few basic tools to help me get through the worst of times, and I no longer feel helpless in traumatic situations. I don’t feel like someone needs to save me, either. I came out of the trauma with yoga, and with a completely new way of looking at life’s unpredictability. I came out of the trauma with yoga, and with a completely new way of looking at life’s unpredictability. What’s your mission as a yoga instructor? Who are you trying to reach and why? My mission is to teach people to heal themselves, and I also work to reach people who don’t see their bodies, skin color, sexual orientation, or gender represented in Western yoga marketing campaigns. Many live in very pressurized environments and don’t realize that there are tools we have available to us, such as yoga, which instantly relieve daily stressors. I still face confrontations and challenges. Sometimes I don’t always succeed in resolving them with a calm temperament, but I have succeeded in learning to apply breathing, stillness, and movement as a consistent self-management system when dealing with conflict. What’s your definition of healing? What facilitates the process? My definition of healing is the ongoing and inevitable pathway to inner and outer balance. We will all one day be healed because one day we will die and return to Spirit, to Source. That is not a sad notion, but rather it’s an awareness that we’re all walking along a similar pathway toward a destination. Each person can facilitate the healing process by being happy to be alive and living out their most unbelievable, positive dreams. We can make the journey toward healing joyous, fun, loving, light, exciting, and peaceful. As you mention above, it’s clear that yoga media often does not represent the diversity of the human form or experience. What kinds of changes do you feel are necessary for a true paradigm shift? All yoga practitioners should visit or revisit the yamas and the niymas. The answers and solutions are succinctly wrapped in those 10 principles. I once had a teacher who would not teach a class without each student being able to recite the yamas and niyamas. She held us accountable for our insides, not just the outsides. All yoga practitioners should visit or revisit the yamas and the niymas. Yoga instructors, teacher trainers, and the entire yoga industry should not be so heavily dependent on someone else to tell them what a pose should look like. My yoga teacher Gopi Kinnecutt says, “Yoga is not a box.” It is never about the pose; it’s about the feeling of the pose. The energetic spirals you create as you transition in and out of breath, asana, and meditation say more about you than how long you can stand on your head does. I have observed skilled contortionists break down in a yoga class because they cannot maintain the breath. The only way change will happen in yoga is when more people start living the practice by observing it from a deeper, philosophical viewpoint. You've mentioned that the conversation surrounding yoga and body image is not about “overweight vs. skinny.” Could you explain what you mean by this? The body image debate is flat and one-dimensional. People are not black or white. We are different hues, colors, gradients, and palettes of substance. Some people do not fit in either overweight or skinny, and the healthy and slim vs. overweight and fat further polarizes the discussion. There are thousands of yogis of all colors, ability, gender identities, and body types on Instagram who can demonstrate yoga poses with confidence and skill, but we don’t know anything about their character. Often when the yoga body image debate comes up, everyone talks about—including overweight women—teaching a specialty class or acknowledging them as if we are doing them a favor. Many people we classify as overweight are healthy, happy, and fully secure. What matters is your capacity to monitor your emotions and elevate your consciousness. I suggest we take the yoga conversation beyond the body and into the spirit of the people practicing. How do we prepare for a 10 a.m. meeting while someone is pressuring us to deliver a deadline? How do we carry ourselves in traffic, as we’re waiting in a long line; or how about when something doesn’t go our way? In these moments, whether you are fat, skinny, or can hold an amazing headstand doesn’t matter. What matters is your capacity to monitor your emotions and elevate your consciousness. What’s your relationship to your own body? How has this changed over time? I have always been very physically active and I have never fit into a stereotype of a “fit” person. I have thick thighs from my West African grandmother and strong arms from my South Carolina grandfather. Attempting to change my heritage is not my priority. I love my body. Yoga and stillness have taught me that there is so much more to this human form, and to asana, than conflicting cultural messages about beauty, fitness, and health imply. Some of my female friends are very self-conscious about their bodies and would do anything to stay thin. Others are very comfortable with their bodies, almost to the point of neglect. My self-concept and self-acceptance settled on feeling good over looking good. I think collectively people are starting to find their own middle ground. More people are redefining health and beauty regardless of stereotypes or marketing messages. The next step is to allow yoga to do its job and represent the spiritual evolution of the mind and body. What advice would you give someone who feels they can’t practice yoga because they don’t have the right kind of body? I would suggest that they start with the most important thing happening within the body: breathing. If you can breathe, then you have the right kind of body for yoga. I would tell them to close their eyes and enjoy a yoga practice. Don’t get caught up in a temporary visual experience. Let the deeper principles of yoga flow through you. Don’t get caught up in a temporary visual experience. I would also show them my blog where I showcase people from all over the world with diverse body types and a beautiful asana practice—but more importantly, people who are changing their characters to better the world. What are some other common, incorrect assumptions about yoga? People assume that yoga is a cure-all and you should suddenly be immune to emotional highs and lows. That is unrealistic and inhumane. Rather, yoga tools such as mantra, meditation, asana, and an ayurvedic diet help us to identify imprints and patterns in our lifestyle. This information helps us to recognize our tendencies, make adjustments accordingly, and turn toward a more balanced lifestyle. Finally, what is the goal of yoga as you see it? Beyond the walls we often construct, how are we all truly connected in this practice? The goal of yoga is to find samadhi, peace, stillness, and contentment while being alive. Being human is a blessing. Ancient yogis were not conventional. They stood for something deeper. They took chances on behalf of change. They recognized the unique opportunity to be a human being. We could have been one of eight billion organisms, but we are living, breathing human beings instead. We encompass everything that ever was, and everything that ever will be. The goal is to make peace with ourselves, and others, by becoming a representative of the peace that exists all around us. Photo credit: Andre Dalton, Wanakhavi Wakhisi.